Cheesebridge has a problem. 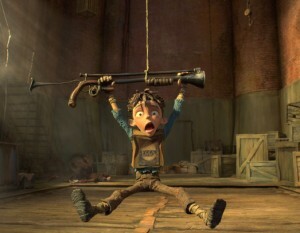 They’re under assault from Boxtrolls, subterranean creatures living in the sewers who come out at night and cause havoc. At least, that’s what Archibald Snatcher (voiced by Ben Kinglsey) has told everyone, and with the apparent kidnapping of the Trubshaw Baby he’s got all the ammunition he needs to convince town mayor Lord Portley-Rind (Jared Harris) to grant him permission to eradicate this supposed menace. 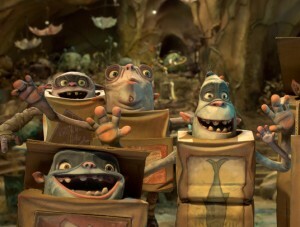 Problem is the Boxtrolls did not abduct and, according to Snatcher, eat, the Trubshaw Baby. They’ve been raising him as one of their own, naming him Eggs (Isaac Hempstead Wright), showing him as much love, devotion and compassion as their community can muster. Yet these past 11 years have seen their numbers dwindle to almost nothing, and soon their whole benevolent world will be extinct. 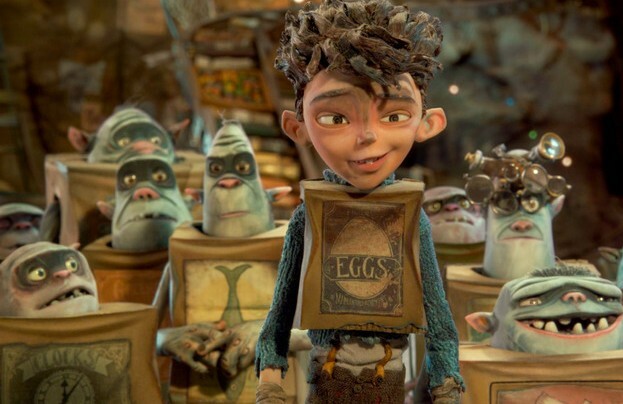 It’s up to Eggs, working alongside Portley-Rind’s impulsive, headstrong daughter Winnie (Elle Fanning), to prove to the citizens of Cheesebridge that the Boxtrolls aren’t what they think. More, they’ve got to reveal to the populace who the real enemy is, the conniving, blood-thirsty Archibald Snatcher’s plan to usurp power over a decade in the making. 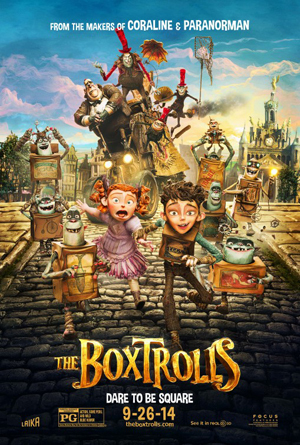 From Laika, the studio known for stop-motion animated favorites Coraline and ParaNorman, comes The Boxtrolls, an ambitious and imaginative adaptation of Alan Snow’s celebrated novel Here Be Monsters!. Not only is the movie a triumph, it’s also one of the year’s best cinematic experiences, a joyous marvel from start to finish. Like a surreal combination of Ernest & Celestine, Frankenweenie, My Neighbor Totoro, Monsters, Inc., Chicken Run and The Triplets of Bellville, the resulting family-friendly frolic had my spirits soaring so high I was kind of hoping they’d stay up in the stratosphere for the rest of eternity. This is Laika’s best film up to now (and I personally felt ParaNorman should have won the Oscar for Best Animated Feature over both Wreck-It Ralph and eventual winner Brave, so that’s something to consider), directors Graham Annable and Anthony Stacchi (Open Season), along with screenwriters Irena Brignull and Adam Pava, crafting a miracle of forgiveness, family and friendship that I adored. It’s emotional without being melodramatic, staying kid-appropriate throughout yet still filled with many bizarre enchantments audiences of any age will go head over heels for. Visually this is as good as it gets. The design of the Boxtrolls themselves is something straight out of every little kid’s wildest fantasies, while the world they inhabit is equally impressive. The adults are like some sort of Monty Python meets Aardman (think “Wallace and Gromit”) caricature, the Red Hat wearing Snatcher’s pursuit of Lord Portley-Rind’s White Hat of leadership – and cheese partying! – inspired. It’s like some warped Salvador Dali fantasy land filled with crooked angles, warped color schemes and curly mustaches, a giddy bit of absurdist exuberance I fell totally and completely in love with. But it is the characters, combined with the superlative vocal work of the entire cast, especially an unrecognizable Kingsley, that ultimately make the movie what it is. Eggs’ evolution is sweet, simple and undeniably authentic. The relationship between Winnie and her self-centered father is more often than not heartbreaking in all the right ways, leading to a form of reconciliation and understanding that’s movingly honest. Snatcher is a grand, despicably villainous over-the-top antagonist whose evil is born from an understandably intense desire to be a part of the cheese-obsessed one-percent no matter what the cost. Then there are the supporting players. Given life by the likes of Simon Pegg, Nick Frost, Tracy Morgan and a fabulous Richard Ayoade, this troop of not-so-bad bad guys and out-of-their-gourd good ones is magnificent on all fronts. 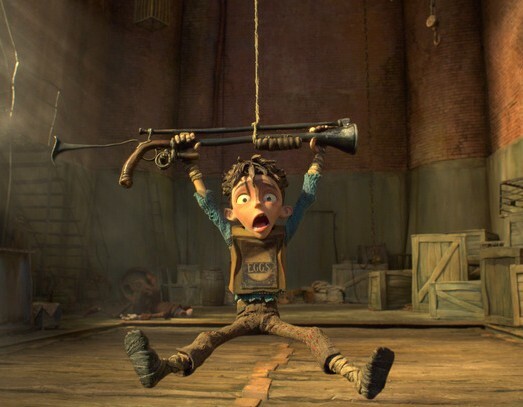 Each finds a way to make their respective characters winningly memorable, continually standing out but never in a way that takes away from the central story revolving around Eggs, Winnie and the Boxtrolls themselves. Some minor pacing issues do arise, and, at first at least, Winnie is a highly unlikable little snot that I admit I had a modicum of trouble warming up to. It should also be noted that, for as busy and as convoluted as things get, there is a decided simplicity to the events that doesn’t always service the chaos being unleashed by Snatcher and his merry band of fellow Red Hats. Not that any of this matters. In a year that has already seen animated triumphs like The LEGO Movie and How to Train Your Dragon 2, The Boxtrolls sets an even higher standard to which they and all similar 2014 releases are sure to be judged against. This is a divine, intoxicating fantasy, and in the end is a first-rate marvel of originality and inspiration families of all shapes, sizes and types will want to get a look at as soon as they can. We are dedicated to creating a distinguished user experience and a website rich in content with solid execution. Our reviews aim for critical analysis of film’s many aesthetics while talent interviews offer insight into the filmmaking process. © 1999 - 2019 MovieFreak.com. All Rights Reserved. No content may be copied without permission. All film titles and photo materials are the property of their respective owners. | Design and implementation by SOKUMEDIA.COM.